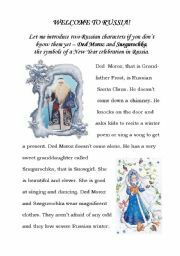 This is a text about Russian New Year characters. Just read and learn more about my country. 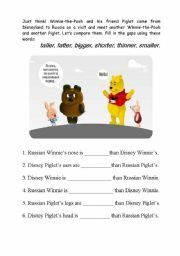 It is a simple fill-in activity where young students have to compare Winnies and Piglets from two different parts of the world. Words to use are comparatives of one-syllable adjectives. This is a matching activity about sports. 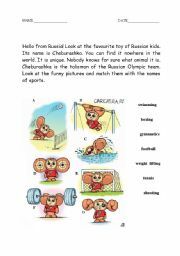 Besides, you will get hello from Russia and learn a little about a unique Russian toy. The pictures are really funny. Enjoy! This exercise is for beginners studying Present Simple Questions. Think well before starting your question. 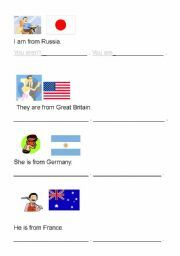 Practise answering WHERE FROM questions for different persons. 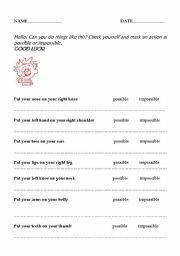 Revise body parts and have fun trying to do these simple actions. Are they possible or impossible? 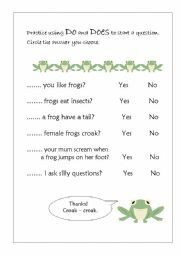 Make your little students occupied with cutting out and sticking. They love it. 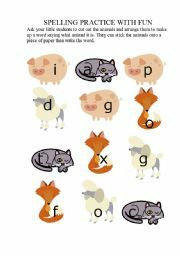 At the same time they will remember the spelling of some simple animal words. 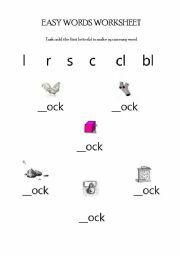 Children have to add the first letter(s) to make up an easy word. The task is to replace the nouns with the right pronouns. But first, teach your students the difference! Then they can think of their own sentences with replacements for each other. Make a negation to the given sentence, then write a true one.